For many, death is a sorrowful event. For Padre Pio, it was like a release from prison or a long awaited journey home. His life was completely oriented toward attaining Heaven. Padre Pio’s health steadily declined during the last years of his life. In 1968, the year that Padre Pio died, Father Carmelo, the superior of the monastery, was keenly aware of Padre Pio’s deteriorating condition. He told Padre Pio that he did not want him to overtax himself and that he could dispense with hearing confessions if he wanted to. But Padre Pio would not even consider it. He never wanted to “retire” from his priestly ministry. He wanted to work right up until the end and that is exactly what he did. A few days before his death, although weak and extremely ill, he insisted on hearing confessions. “He desired to die on his feet, at his place of work, after a day spent with others in prayer and in his ministry for good,” Father Carmelo said. 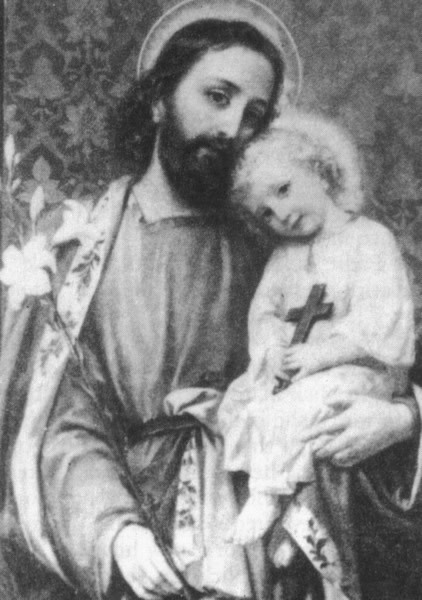 The painting of St. Joseph that Padre Pio prayed before during the last months of his life. Not long before Padre Pio passed away, he spoke to Brother Modestino Fucci and asked him to assist him with his prayers. “But Spiritual Father,” Brother Modestino said, “it is you who must pray for me.” Padre Pio answered him, “My son, I tell you that the justice of God is severe. Pray for me.” Brother Modestino understood then that Padre Pio was speaking of his death. Padre Pio also spoke about his death to his friend, Carlo Trabucco. He said to Carlo, “When my time comes to leave this life, if my heavenly Mother is not there to hold my hand, how will I have courage?” Carlo then began to contemplate the thought of his own death, knowing that he too, would have to render an account to God. As Carlo thought about it, he began to tremble. Padre Pio told his spiritual daughter, Josephine Bove, that he would die when the crypt in the church of Our Lady of Grace was built. He knew that the Capuchins were planning to build a crypt for his burial. Nevertheless, he indicated that it was not his desire to be buried in a specially made crypt. Rather, he wanted to be buried in a simple grave. The construction of the new church of Our Lady of Grace was finished in 1959. Josephine Bove was afraid that the completion of the new church might in some way be a signal of Padre Pio’s death. 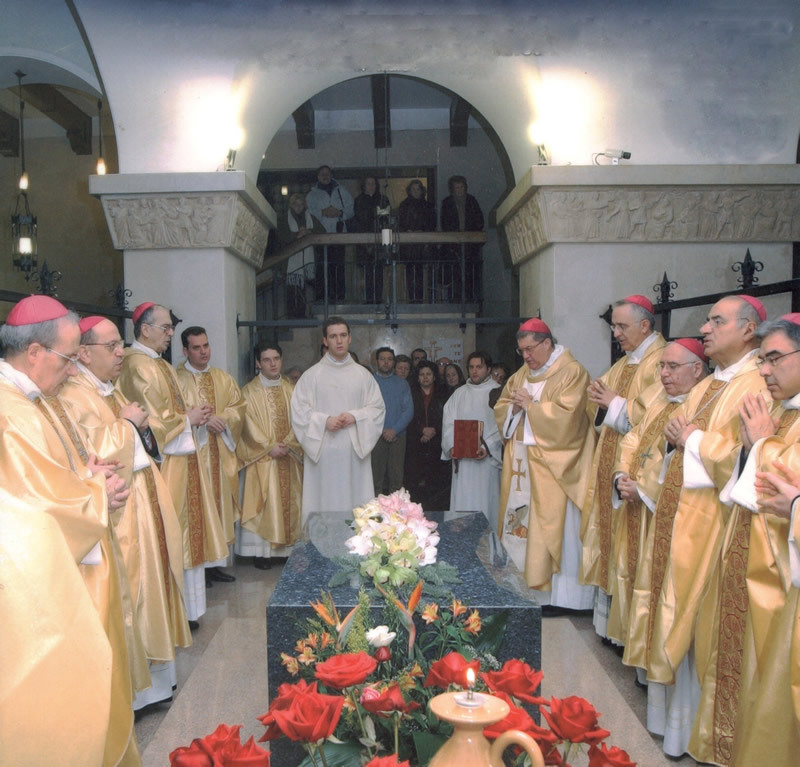 But the building of Padre Pio’s crypt was put on hold for a number of years. It was finally completed and was blessed on September 22, 1968. Padre Pio died sixteen hours later. The woman explained to Father Alberto that she had made the long journey to San Giovanni Rotondo from Sicily. She was poor and had made great sacrifices to get to the monastery. She did not have enough money to stay overnight in a hotel but would have to return to Sicily that very day. All of her life, she had wanted to see Padre Pio but could never afford to make the trip. A few days before, she had a vivid dream. In her dream Padre Pio said to her, “If you want to see me, come to San Giovanni Rotondo immediately because in a few days I will die.” She had to borrow the money for the travel expenses. Father Alberto was skeptical about the woman’s words. He believed that she was making up the story for her own purposes. He heard the same type of requests day in and day out and the more desperate the people were, the more they tended to exaggerate the truth. He had no indication that Padre Pio was going to die any time soon. When the woman began to cry, Father Alberto’s heart softened and he decided to help her. He led her through a corridor of the monastery to the elevator and told her to wait there. Padre Pio would be coming that way shortly. The woman knelt down and waited. When Padre Pio passed by the area where she was kneeling, he stopped. He looked at her with great tenderness and spoke to her. She was deeply moved when he placed his hands on her head, giving her a blessing. Before leaving the monastery, she returned to the confessional to speak to Father Alberto. With tears in her eyes, she thanked him with all her heart for arranging the meeting. It was just fifteen days later that Padre Pio passed away. September 20, 1968 was the 50th anniversary of Padre Pio’s stigmata. For Padre Pio, it would be a day like any other day, a day devoted to Mass, prayer, and service to the Lord. But it was not a day like any other day for his spiritual children from around the world. Many had come great distances to be present for his anniversary. The Mass on September 20th was at the usual early morning hour of 5:00 a.m. and the church was filled to capacity. Many people had to stand outside during the Mass. In keeping with Padre Pio’s wishes, there were no speeches, no festivities, no celebration. There was only one exception to the rule and that was the hundreds of deep red roses that decorated the sanctuary of the church. The crucifix in the choir loft before which Padre Pio received the stigmata on September 20, 1918, was also adorned with beautiful red roses. It is hard to put my impressions of Padre Pio’s Mass into words. All I had heard and read about his masses were true. I was touched by the humility, the sincerity, and the great faith of this man of prayer. He seemed oblivious to the noises and exclamations, the pushing and shoving that was going on in the church as people edged closer to get a better look at him. He literally lived the Mass. He relived the Passion of Christ. From the expression on his face, he actually suffered with Christ. As far as I could judge, the sufferings of Padre Pio were greatest at the moment of the consecration of the Mass. His eyes sometimes would close, his face would contort in pain, and his lips would tremble. Frequently I saw him wipe tears from his eyes with his handkerchief. He was seated for the Mass and faced the people. In obedience to his superiors, the Mass lasted only a good half hour. Like Father Armand, Dorothy Boes was another one of Padre Pio’s spiritual children who attended the Mass on September 20. Dorothy had always had a great desire to visit Padre Pio and when she heard that there would be a Mass at Our Lady of Grace monastery celebrating the 50th anniversary of Padre Pio’s stigmata, she immediately applied for a passport to travel to Italy. She received it just in time. Dorothy and her friend Mary arrived in San Giovanni Rotondo on September 19. Knowing how crowded the Mass would be the next morning, they decided to get to the church at 2:30 a.m. to wait for the doors to open. When the church finally opened, the two women were almost knocked down by the crowds who rushed in all at once. Nevertheless, Dorothy and Mary managed to find good seats in the front. Mr. Gino Pin and his family also came to attend the 50th anniversary Mass of Padre Pio’s stigmata. Gino had a great devotion to Padre Pio and was a tireless worker for the Padre Pio prayer groups in Biella, Italy. Father Alberto D’Apolito was very happy to greet Gino when he arrived. He felt sorry for Gino because he knew that he had experienced many difficulties in his family life. Padre Alberto went to Padre Pio with a request. He handed him a holy card and asked him to write a devotional message on the back. He did not tell him who he was going to give it to. He knew how much it would mean to Gino to have a prayer card that Padre Pio had inscribed. Padre Pio kissed the holy card and blessed it and wrote on the back, “May Jesus and Mary always sweeten your sorrows.” When Father Alberto read the message, he was disappointed. He did not want Gino to be reminded of his “sorrows” for he had experienced one trial after another in recent years. He decided not to give the holy card to Gino. Afterward, Father Alberto decided to give Gino the holy card that Padre Pio had signed. Gino read the message on the back of the card and his eyes filled with tears. He said to Father Alberto, “Did you see the message that Padre Pio wrote to me?” indicating the reference to his “sorrows.” Father Alberto encouraged Gino by saying, “Be strong. Padre Pio is with you. He will help you.” Later that evening, Gino came back to the monastery to see Father Alberto. He was crying as he told Father Alberto that his daughter, Maria Pia, had just been admitted to the hospital and was in very serious condition. The doctors suspected that she had a tumor or possibly peritonitis. Father Alberto finally tapped Padre Pio to get his attention and he then looked up in surprise. “Padre Pio,” Father Alberto said. “Gino’s daughter, Maria Pia, is in the hospital in very serious condition. She may need an operation. Gino needs your advice. He wonders if he should take her back home to Biella. What should he do?” “She should not be moved from the hospital,” Padre Pio replied. “If she needs an operation, she should be operated on here and not in Biella.” “Gino is a poor man,” Father Alberto said. “He cannot afford to have his daughter remain in the hospital and he cannot afford the cost of an operation. Can’t you invoke a cure from the Blessed Virgin for Maria Pia so that she doesn’t have to have an operation?” “Yes, I will pray about it,” Padre Pio answered. Several hours later when Dr. Gusso, the head physician of the Home for the Relief of Suffering examined Maria Pia, he found that she was completely well. She was immediately discharged from the hospital. The miraculous recovery of Gino Pin’s daughter occurred on September 22, one day before Padre Pio’s death. It is considered to be possibly the last miracle, the last grace invoked by Padre Pio to the Blessed Virgin, before he died. Padre Pio was extremely weak and ill on the day that Marissa arrived with her nieces and their mother. It was September 22 and the church was full to overflowing. The members of Padre Pio’s worldwide prayer groups were present at the Mass that morning. They had come to San Giovanni Rotondo to attend the International Prayer Group Congress. Padre Pio said Mass on that day in thanksgiving for the prayer groups and in special thanksgiving for the official approval and recognition they had recently received from the Holy Office in Rome. It was a great joy for Padre Pio to know that his prayer groups were established on a firm foundation and were flourishing worldwide. During the evening, Padre Pio called Padre Pellegrino to his room five or six times asking for small necessities. Every time he entered the room, he noticed tears in Padre Pio’s eyes. Nevertheless, Padre Pio joked with him by calling him Don Pellegrino rather than the usual, “my son” or “my brother.” He always called him Don Pellegrino whenever wanted to make him laugh. I, Padre Pio of Pietrelcina, vow and promise to Almighty God, to the Blessed Virgin Mary, to our Holy Father, Saint Francis, to all the saints and to you, Father, to observe all the days of my life, the Rule of the Friars Minor, confirmed by Pope Honorius, and to live in obedience, without property, and in chastity. Padre Pellegrino spoke the response, “If you abide by this, on behalf of God, I promise you eternal life.” Padre Pio said that he could not breathe well in bed and wanted to get up. “Are there any stars in the sky tonight?” Padre Pio asked. “Yes, indeed. The sky is studded with stars tonight,” Padre Pellegrino replied. “Let us go to the veranda then and see,” Padre Pio said. Padre Pio had severe arthritis and at eighty-one years of age, his posture was stooped and bent. Because it was very painful for him to walk, he used a wheelchair most of the time. But on this night for some reason, he was able to stand up straight and he walked briskly and with great ease, to the veranda, needing no assistance. To Padre Pellegrino, he suddenly looked twenty years younger. Right after Padre Pio spoke of seeing “two mothers” he seemed to grow weaker. He broke out into a cold sweat and his lips began to turn blue. Padre Pellegrino became alarmed and started to go to get assistance. “I do not want you to disturb anyone,” Padre Pio told him. “Do not waken anyone.” But Padre Pellegrino insisted on getting help and quickly left the room. He woke up Brother Bill Martin and told him to place a call to Dr. Giuseppe Sala immediately. After that, Padre Pellegrino woke up all the other Capuchins and told them to hurry to Padre Pio’s cell. Dr. Sala arrived in less than ten minutes and realized that Padre Pio was having a severe bronchial asthma attack. He gave him an injection as well as oxygen in an attempt to ease his breathing which had become difficult and labored. The Holy Oils were prepared and Father Paolo gave Padre Pio the Last Rites. Padre Pio was fully conscious and was very much aware of all that was happening. His feet and hands were becoming very cold and he was perspiring heavily. When the doctors realized that he was having a heart attack, he was given an injection directly into his heart. With his eyes closed, he continued to repeat the words, Jesus . . . Mary . . . Toward the end, his lips formed the words but he could make no sound, not even a whisper. The Capuchins called out to him, “Padre, Padre!” He opened his eyes one last time and looked at his dear Brothers. At 2:30 a.m. with his Rosary clasped in his hands, Padre Pio gently bowed his head and died. 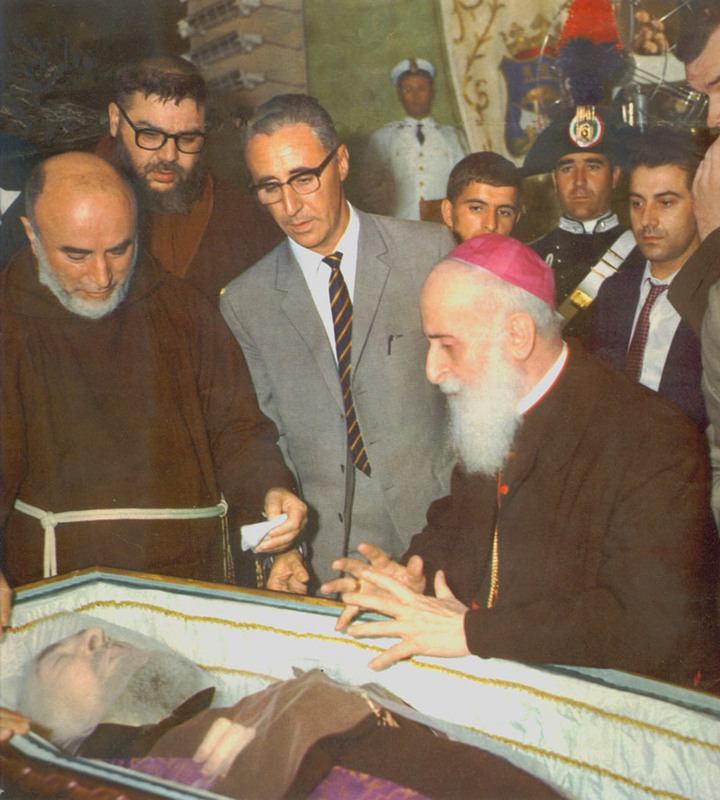 Dr. Gusso, who had been present during Padre Pio’s final moments, stated that it was the most gentle and beautiful passing that he had ever witnessed. Padre Pio had lived a holy life and he had died a holy death. When Dr. Sala and Father Carmelo examined Padre Pio’s body after his death, they discovered that the stigmata on his hands, feet, and side had disappeared completely. His skin was now smooth and regenerated in the places where the wounds had once been. There was no scarring whatsoever. The skin looked as fresh as that of a newborn baby. Dr. Sala noticed the beautiful fragrance of orange blossoms in the room. He had perceived the fragrance on many occasions when in the presence of Padre Pio. As the two stood together and looked at Padre Pio’s lifeless body, a scab detached and fell from his left hand. It was the very last sign of the wounds of Christ which he had carried on his body for fifty years. Padre Pio looked beautiful and serene in death. A Rosary was placed in his hands as well as a crucifix and the Rule of Saint Francis. Around his shoulders was draped his priestly purple stole. Before the funeral began, the casket that contained Padre Pio’s body was placed in an open hearse. Slowly and solemnly it made its way through the narrow streets of San Giovanni Rotondo, stopping in front of the Home for the Relief of Suffering for a last salute. The funeral procession took more than three hours. Air force and police helicopters flew overhead, dropping flowers and prayer cards on the huge crowd below. It is estimated that one hundred thousand people attended Padre Pio’s funeral Mass. His body was placed in a granite crypt and buried directly below the main altar of the church. Bishops gather in San Giovanni Rotondo to pray at the tomb of Padre Pio. The stories that attest to Padre’s intercession since his passing are too numerous to count. One impressive testimony concerns a woman named Constance Woloskiuk who turned on her television set on September 23, 1968. She learned the news that Padre Pio has passed away that very morning and saw the crowds of people in San Giovanni Rotondo, all gathered to pay their last respects. Constance had been suffering for a long time from a very painful lower back condition. As she listened to the report of Padre Pio’s death on her television set, she sent up a heartfelt prayer to him, asking for healing. Immediately, she noticed that all the pain in her lower back had vanished. Almost in disbelief, she kept getting up out of the chair and sitting back down again. That was something that previously, she could only do with great difficulty. It was a true miracle. That night Mrs. Roversi had a dream in which she saw Padre Pio standing in front of her. He said, “Look, I can help you now much more than I could when I was on earth.” His hands were open and she saw that he no longer had the stigmata. In her dream, she said to him, “I know nothing about running the store and I am afraid that I will not be able to do it.” Padre Pio said to her, “Go forward with it. I will help you.” He showed her his hands and for the second time she saw that the wounds of the stigmata were gone. Then she woke up. Mrs. Roversi acted upon the advice that Padre Pio had given her in the dream. She learned how to manage the store and everything went smoothly from that time on. The business did well and she was able to provide for her two children. “I will be able to help you more from Heaven that I can on earth,” Padre Pio often said to those who sought his counsel. And it is from Heaven that he has been helping so many of his spiritual children from every part of the world.